That Organ Symphony of Saint-Saens has attracted so much attention that his other four symphonies have been almost completely upstaged, which is a pity, for they are all fascinating and approachable, and make rewarding listening. This BIS release has arrived at the same time as a repackaging of Martinons recordings of the five symphonies (minus Africa) as a two-CD EMI reissue, thus giving me an ideal opportunity to compare the considerably different approaches of both conductors. Some readers might be surprised to learn that there are five Saint-Saens symphonies, for it has often been claimed, erroneously, that the composer wrote only three. The misunderstanding arose because two of them were not published during Saint-Saens lifetime. The Symphony No. 2 in A Minor, op. 55, on this disc, was the fourth symphony that he composed - it was written in 1859 but not published until 1878, which accounts for its relatively high opus number. The other symphony here, the early, unnumbered, Symphony in F Major, known as Urbs Roma (actually, the third to be written) was composed in IX56 when Saint-Saens was 21 years old. The famous Organ Symphony, known to us, confusingly, as No. 3, was composed last of all in 1886. The Second Symphony is classical in idiom with influences of Mozart, Beethoven, and Mendelssohn. Saint-Saens orchestration is restrained. He uses no trombones and only two horns. It is the stern, crisp, classical, almost Beethovenian approach that Kantorow adopts throughout this Symphony (and in the Urbs Roma Symphony); his tempos are consistently faster than Martinons. Kantorow generates considerable tension and excitement, and armchair conductors will have difficulty in restraining themselves. On the other hand, Martinon prefers a more relaxed, more rhythmically flexible approach. On the whole, Martinons Symphony sings; Kantorows marches. I hasten to add, though, that Kantorow is warm, gentle, and elegant enough in the Adagio, but it is Martinon who is the more Romantic, his readings having those telling little extra nuances and more light and shade. In the Prestissimo finale, Kantorows breathless dash, stretching his strings to the limit I would imagine, obscures all the detail that Martinon reveals-and he manages to make the tarantella whirl excitingly enough. Urbs Roma means the City of Rome, but there are no real points of reference to it, either biographically or musically, in Saint-Saens symphony. The opening Largo begins imposingly, however, suggesting former Roman splendour. Once again, Kantorow opts for the no-nonsense, hard classical line, but tempered, this time, with more charm and tenderness. Martinon, once more, chooses the sunnier, more Romantic and relaxed route. His Poco allegretto has some delicious woodwind phrasing discreetly, and hauntingly, backed by pp brass chords. In this movement, Martinon closely rivals Kantorow for excitement, and he somehow invests the music with added heroism and dignity. The jolly and colourful Africa for Piano and Orchestra, full of good tunes, was composed in 1890 when Saint-Saens had visited Cairo and Alexandria. It is a sonic picture postcard of North Africa, featuring a Tunisian folk melody. It is a virtuoso showpiece for the piano, and Laura Mikkolas fingers flash over the keys in response to Kantorows relentless speeds. Her interpretation is brilliant, every note and chord clearly delineated; and she has an engagingly light touch that clearly conveys that she is enjoying the music tremendously. 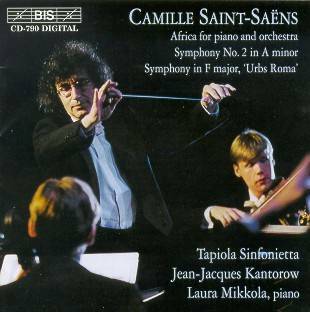 Africa is also available in a very enterprising concert, on the Cala label, of little-known and very exotic Saint-Saens music that includes three world premiere recordings of short orchestral items as well as the composers Requiem. The Cala soloist, in Africa, is Gwendolyn Mok, who has not quite the brilliance and assurance of Mikkola but she is served by a more illuminating and atmospheric accompaniment (the woodwind playing is especially evocative of sinuous North African rhythms) by Geoffrey Simon and the London Philharmonic Orchestra. Summing up, personal choice will dictate between Kantorow and Martinon. I am sitting firmly on the fence on this occasion: I like both styles of interpretation. "This review originally appeared in Fanfare (Nov/Dec 1997) and is reproduced by kind permission of that publication"